Skyscanner Product Manager Laura Haines talks artificial intelligence, user-centric interface design and interactive prototypes. Over 50 million users a month use Skyscanner, the travel search platform that has, in only 13 years, grown to be one of the travel industry’s most valuable companies – $1.6 bn at the last reckoning. With its own back-end algorithm search system, almost 60% mobile users and recent forays into artificial intelligence, Skyscanner certainly earns its tech stripes; but it also has to meet the emotional expectations of users worldwide, solving complex travel requests faster than the competition. 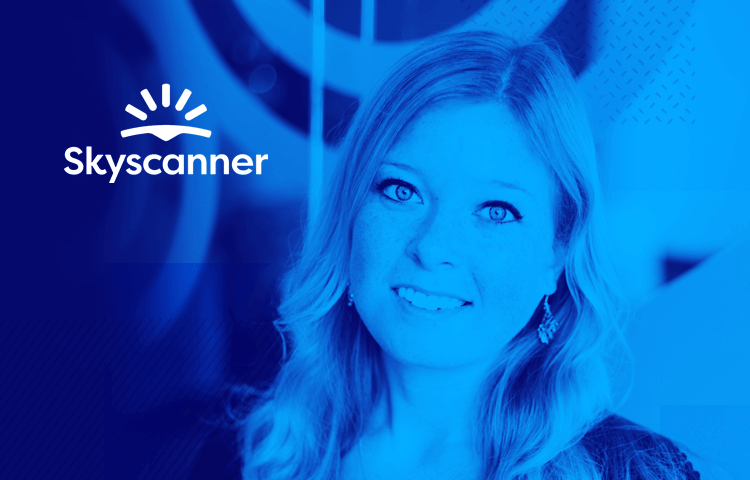 Product Manager Laura Haines is the woman in charge of ensuring that users across the Americas keep looking to Skyscanner to find flights, rental cars and hotels. Laura spoke to Justinmind about conversational chatbots, data crunching her way to awesome user interfaces, and what makes a good product manager great. Can you tell us more about Skyscanner and your role there? Skyscanner is a travel search engine making it easy for travelers to search and compare flights, hotels and rental cars to find the best deals. We help over 50 million users a month plan their travel through our app, website and business tools. My role at Skyscanner is to ensure we create products to suit the needs of the individual markets across North and South America. This entails creating solutions and unique approaches to traveler problems in order to define strategies and grow each market. It sounds cliché but there really is no such thing as an average day at Skyscanner and definitely not for me – which is great! I’m involved in many facets of the business. For example, working with our partners to ensure our users are getting best travel coverage and experience; to developing experiments alongside engineers to innovate and personalize our products; to collaborating with our growth hacking teams on ways to amplify our product; to user testing and performance analysis; to writing code. The only thing that is consistent about my job is the fact that I am always challenged and have endless opportunities to make true impact. Download Justinmind today and build great products! More and more users are navigating almost solely from mobile devices. What kind of challenges and opportunities does that throw up for you and your team? We are a mobile first company and that point of view ensures that all design considers mobile usability first, and is then adapted for desktop. By focusing on the mobile UX, we improve usability of our products and consider mobile-centric challenges first – things like page weight, assuming users are connecting over a mobile network, not WiFi. We are faced with challenges like the limitation of screen real-estate, multiple device and operation system combinations that our products need to be compatible with, as well as ensuring partners provide travelers with the same great mobile experience. Mobile also brings a lot of excitement. There are many features of mobile devices that open up new platforms, new features and even new products to us. You recently launched a conversational chatbot for flight searches. What are some of the challenges of conversational interfaces, and what do you hope the benefits will be? Yes, we launched a Facebook Messenger bot in May, and most recently we collaborated with Skype to build a travel chat bot for their platform. We see chatbots as a precursor to voice search, although we also have a voice search skill for Amazon Alexa. Skyscanner was the first travel search provider to integrate with Amazon Echo system, allowing people to find flights using just their voice. Designing for voice and chatbots requires guiding the user experience. With chatbots we are able to guide them with response questions, but bots can’t understand context, hence we’ve had to really be particular about the response requests. For example, the return date needs to be an actual date and not a number of days in the future. Even though bots can understand a lot, there’s a lot of learning to do. Skyscanner’s aim is to inspire travelers – how does the team design UIs for ‘inspiration’ in a product that essentially fulfils a very functional desire? Yes, travel inspiration is one of our aims, however it is important to note that we also want to make booking travel as easy as buying, say a book online. We aim to provide an easy to use UI that encapsulates the excitement of travel, and provides comprehensive details so travelers can make an informed decision. We put a lot of effort into the user experience; from incorporating destination images into our product to inspire travel, to creating information and inspirational content to help guide travelers. Our search and filter tools follow the model of an easy UI + travel inspiration. For example, our Everywhere feature lets you search from your airport of choice to everywhere and shows you the cheapest flights to help you discover your next destination. Once someone discovers where it is they want to go, we ensure that our products make it easy for the traveler to uncover and obtain the best travel options to suit their needs. Skyscanner is all about addressing travelers’ pain points. How do you tell what a user’s needs are? How do those insights influence the design process? Skyscanner is very data driven and we pay attention to both qualitative and quantitative data to uncover how people are using our products. We have large quantities of information at hand, including Google Analytics, key performance indicators, experimental analysis, and user data. By consistently monitoring and analyzing the data, we are able to understand the product journey and make decisions. The design is dictated by the skills and knowledge of our designers, as well as the feedback from our users. We make it a point to get early feedback and iterate to meet traveler needs and create the best solutions we can – verified by the data. What’s the role of prototyping in good Product Management? And what do you as a Product Manager look for in a prototyping tool? A Product Manager is the intersection between technology, business and user experience and has to develop a product that is valuable, feasible and usable. Prototyping plays a big part in the process of uncovering potential solutions, communicating that to the business and demonstrating functionality to users to gain feedback. As a developer previously, I have the skills to create high and low fidelity prototype, but as a product manager I look for tools that can quickly create something tangible to help make the best decisions. Can you give us an example of a time a prototype helped you solve a tricky situation or produce something really cool at Skyscanner? Prototyping is a big part of our process, from helping UI layout decisions to mapping innovative ideas into reality. The benefits of prototyping really stood out when we were trying to redesign the user flow and screens in the mobile app. Our designs had some initial sketches but we couldn’t decide which variants to take further. We created basic prototypes and loaded them on to mobile devices, one hour later we were in the local coffee shop getting direct feedback from users which all fed in to our plans and the final solution. Prototyping plays a big part in the process of uncovering potential solutions, communicating that to the business and demonstrating functionality to users to gain feedback. What would be your best advice for someone setting out on a career as a Product Manager in software development? The industry correctly talks of Product Managers needing to wear many hats: the leader, the influencer, the engineer, the designer, the strategist, the analyst, the executor – the list goes on! If you are an aspiring Product Manager, then you will need to bring a great breadth of skills to the role and you will be using them every day. The role involves discovering a product that is valuable, usable and feasible – you have to connect the business, user experience and technology. A good product manager must be experienced in at least one, passionate about all three, and knowledgeable with practitioners in all. Work on your communication skills, these are vital to listen to users and stakeholders, communicate with development teams, spread your product vision throughout the business. The role is demanding and you can switch from strategic to tactical activities, speaking with engineers to sales, marketing and commercial in the blink of an eye. Become obsessed with the detail, the data, the product and your vision and revel in the fact that you have the fantastic opportunity to work with everyone in the business to create products to solve real user problems and play a very large part in your company’s success.